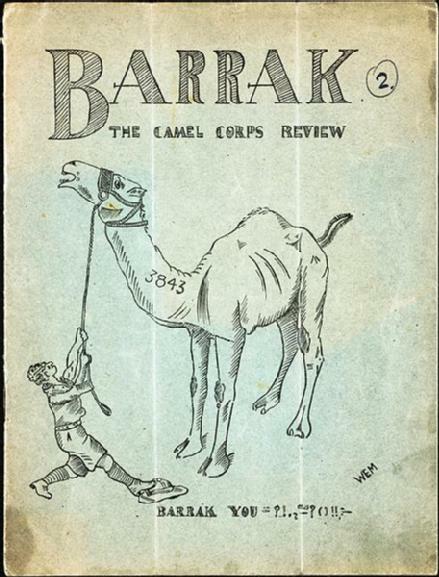 Not only was there an Imperial Camel Corps during the First World War, but there was also a periodical, entitled Barrak, dedicated thereto, as you can see from the example above. The Corps was started in January, 1916, and served on fronts in the Middle East. It was not, you may be surprised to find, the first camel-mounted British military unit. The Imperial's predecessor, the Somaliland Camel Corps, was initiated in 1912, and endured until 1944. A colonial protectorate with ties to their imperial holdings in India, British Somaliland, part of present-day Somalia, was under British rule from the 1880s to 1960, except for a brief period of occupation by Italy in the 1940s. The Somaliland Camel Corps enforced British governance of the protectorate. Its numbers were largest during its earlier phase, with up to 700 riders fighting rebels in the area during the Great War years. 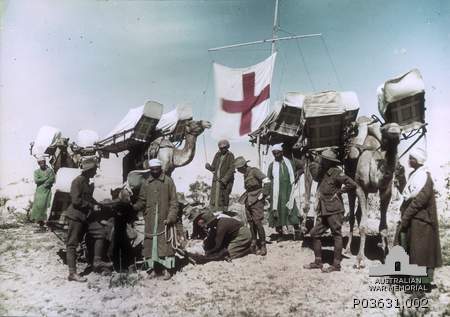 Four camel ambulances of the Imperial Camel Corps, Egypt, c. 1918. 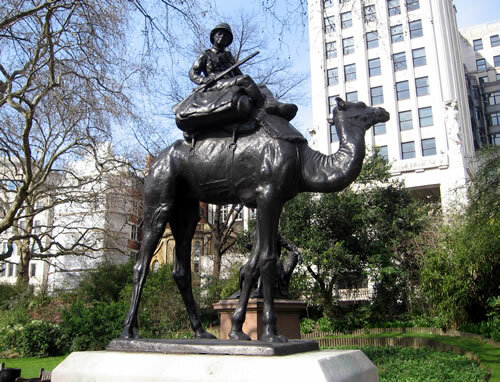 Imperial Camel Corps memorial, statues in Victoria Embankment Gardens, London. The Imperial Camel Corps (ICC) was formed in January 1916 in order to deal with the revolt of pro-Turkish Senussi tribesmen in Egypt’s Western Desert. The first four companies were recruited from Australian infantry battalions recuperating after Gallipoli. Four battalions were eventually formed. The 1st and 3rd were entirely Australian, the 2nd was British, and the 4th was a mix of Australians and New Zealanders. The ICC also had its own machine gun unit, and a battery of light artillery recruited in Hong Kong and Singapore.